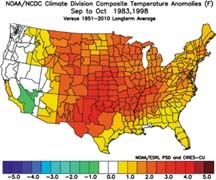 All of that yellow, orange, and red represents MUCH warmer than average temperatures. So, this warm weather should not come as any surprise. 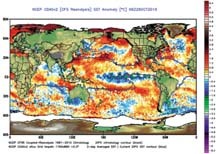 The coolest water associated with the developing La Niña is located in the Central Pacific Ocean versus just off the coast of South America. This feature will also likely have implications for the upcoming winter. You can also see warmer than average water off the West Coast of the United States and MUCH warmer than average water in the Gulf of Alaska. While the PDO is much cooler than it was just a few months ago, it is still positive. A positive/warm PDO usually does not produce a pattern favorable for colder than average weather for us. In fact, it is usually the opposite...especially when other forces are at work. All of the major teleconnections tied to the Pacific Ocean have been or are in a very positive mode. 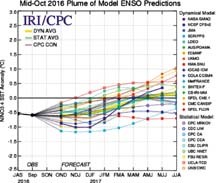 When considering this, the PNA seems to have the biggest impact on us right now. 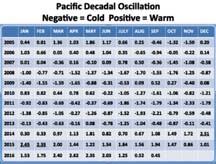 A very positive Pacific / North American Oscillation (PNA) floods us with warm Pacific air and keeps most of us warmer than average. 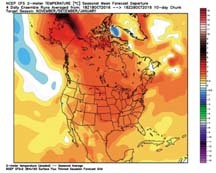 With this particular model, you can clearly see the trend toward a warmer than average winter. The CFSv2 also shows a pretty stout dry signal across parts of Texas. 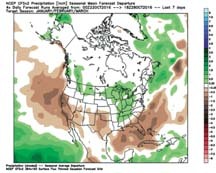 I won't go through every model here but did want to show you the NMME Model and what is is showing. Remember, the NMME stands for North American Multi-Model Ensemble. I.E. it is looking at a bunch of different models. 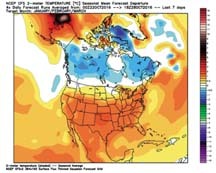 Like the CFSv2 Model, the NMME (which does include the CFSv2 Model) is showing a warm winter. It is also showing that same stout dry signal for Texas and much of The South. Based on the current trend and what is likely to occur in the coming months, I can't disagree with that. Regarding temperature, I think it is a pretty done deal that our winter will be warmer than average overall, especially the farther west you live. Areas farther east will eventually get colder, but that may also take a while. 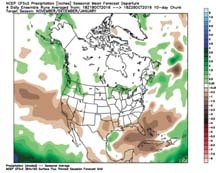 If we are going to see a period of time that could potentially allow us to see more active and potentially wetter type weather, it would be during the spring. I remain somewhat skeptical, but at least we may have a better chance.